I've been experimenting with Network UPS Tools package under Linux latetely, and put together this template for device monitoring. Specifically, this plugin uses PHP sockets to open a connection to the NUT daemon on the target host, and then uses the NUT protocol to enumerate and query the UPS devices for operational details. This model allows for more flexibility and speed over alternative approaches, but the downside is that you must have the PHP sockets library installed and operational. Last edited by ehall on Thu Nov 11, 2010 9:24 pm, edited 9 times in total. I had trouble importing both the cacti_data_query_nut_ups_statistics.xml and the cacti_graph_template_ups_nut_ups_power_signal.xml files. Both imports reported 'Unmet Dependency: (Data Template Item)' multiple times. I am using Cacti 0.8.6.i and PHP 5.1.6 on Fedora Core 5. I exported everything possible. Delete whatever you've already got, import all the XML files, and copy the script to the right place. Let me know if that fixes it. Attached is a screenshot of importing the power signal template. I have also determined that the nut_ups_status.php is getting called. However it looks like the RRD files are not being generated. Didn't help. I deleted the NUT data queries, graph templates and data templates along with the scripts. I reinstalled the php and xml scripts, and reimported all templates. I still get the Unmet Dependency messages on importing the cacti_graph_template_nut_ups_power_signal.xml and cacti_data_query_but_ups_statistics.xml files. If I add these graphs do a device, I can see where the cacti poller is successfully calling the php script and adding the results to the poller_output table. But cacti is not producing an RRD file for the graph. After some tedious fixing I got this to work. I'm attaching my version of the .xml, but I wouldn't be surprised if this gives the same errors again. First of all, the data query file seems to be the only thing you have to import. It automatically includes all the other things. So just import it, either my version or the original one. If you get unmet dependencies again, you can just fix up the data query + graph template (?) yourself. What happens is it loses the actual fields to graph, so if you manually reselect them everything will be fine again. Before importing this, you might want to get rid of all the old UPS stuff first. My db was a total mess, I had to clean up parts of it by hand using the MySQL command-line client. I took a look at these files and I don't see where you put the OID's. I did see that you put attribute descriptions. Is this what cacti will use to obtain the information requested? If so, the names in my MIB tree on my TrippLite 3000 are slightly different.. I don't think you would use this to gather the stats we would want, so where is the file that would contain the OID's for each of these? Is this something that needs to be configured on my end? If so, where (or which file)? Obviously I don't know much about this all yet,, but I'm reading as much info as I can. Thanks in advance for any help I can get from you. This doesn't use OIDs because it's not using SNMP. It's querying upsd using the upsd protocol. 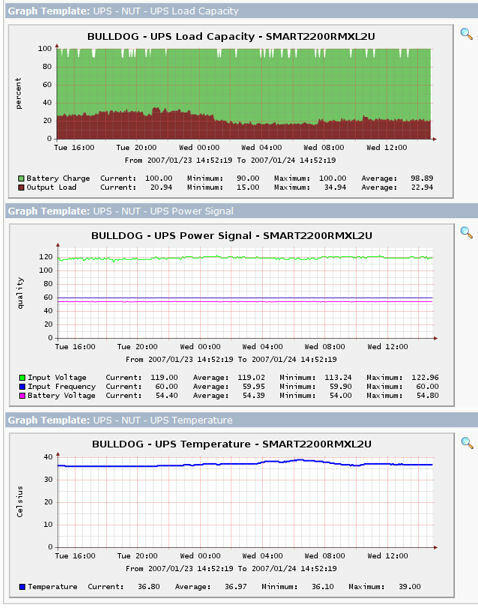 You need to configure upsd to talk to your particular UPS first. Thanks for your help on that. I scrapped these xml files and created single OID data templates. Created my own graph templates. It took some time to learn all of that, and the graphs don't look nearly as good, yet, but I learned a lot about how cacti works. Created my own graph templates. It took some time to learn all of that, and the graphs don't look nearly as good, yet, but I learned a lot about how cacti works. Hmm, that shouldn't be necessary. I just fixed the broken templates, and my graphs look just like the screenshots. Post subject: Not getting device. I tried to install this. 1 of the 2 was solved by a update in this issue, but the second one still exists. the ups is connected to the localhost. 2. You need to x out the duplicate entries for inputVoltage, batteryVoltage, etc. Just make sure the first tab of each type is listed, only. Click save. 4. Click through to the NUT Load Capacity, Power Signal, and Temperature templates to make sure the corresponding fields like inputVoltage match; fix them if needed so they correspond again and click save. Those were the main ones. From here, another helpful tip is to go into Data Sources under the Management area, and select each of the UPS Nut entries. When you go in there you will see a 'turn on data source debug mode' at the top right of the cacti screen. When you click that, you should see the rrdtool create command show up where you can confirm that inputVoltage, batteryVoltage, etc, are each listed just once. If cacti has trouble creating this you can paste that entire command into a shell into the /var/lib/cacti/rra directory or similar, then fix the permissions on the file that gets created. Perhaps the next person will fill in any further gaps that I've missed. good luck! I finally got these nut php script graphs to work. I had several "wrinkles" trying to get these scripts working, First I got the "unmet dependencies" errors when importing the templates, regardless of what order I imported them in.